The Prophet and the Warlock will be the next piece of DLC for Total War: Warhammer II, and it’ll release on April 17. With last year’s Queen and Crone DLC having fleshed out the High and Dark Elves, the community has been eager to see the Skaven and the Lizardmen get the same treatment. Embracing a thematic contrast between magic and science, the Prophet and the Warlock adds the skink prophet Tehenhauin and the warlock-engineer Ikit Claw. They’ll each bring several units from the tabletop game that didn’t make the cut at Warhammer 2’s vanilla launch, including fire-spitting Salamanders, savage flying Ripperdactyls, and a range of deadly Skaven weaponry such as Ratling guns, Jezzail snipers, and Doom-flayers, which are basically bladed motorbikes. You can see all these in action in a new trailer, below. Developer Creative Assembly also confirms that the Prophet and Warlock will add Regiments of Renown for both its star factions, as well as new mechanics to spice up the Lords’ campaigns. 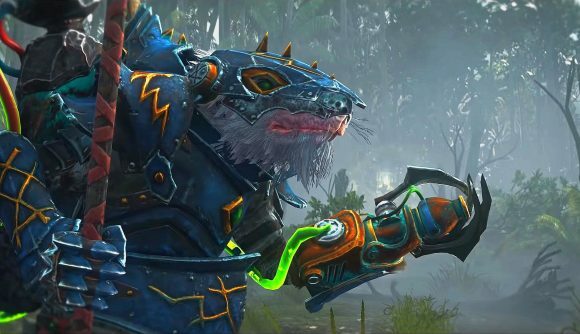 As is custom by now, a free update will land alongside the DLC, adding “a yet-to-be-revealed Legendary Lord, a new Skaven Under-Empire mechanic, and a millennia-old lizard ghost” for all players. That “millennia-old lizard ghost” sounds an awful lot like Lord Kroak to me, which is hugely exciting. The Venerable Lord Kroak was the first Slann Mage-Priest spawned in the Warhammer world, and a wizard so powerful that even death couldn’t wholly dampen his powers. You can read more on the Total War blog. You can pre-order the Prophet and the Warlock on Steam here, and, as is CA’s wont, doing so will get you a 10% discount on its price of $8.99 (£6.99) – a slight increase on Queen and Crone. We’ll bring you our thoughts on the DLC as soon as we can, if you’re on the fence. A Lizardmen/Skaven Lord pack had been widely expected, but what may be next for Warhammer II is less certain. Warhammer I got two Lord packs and three race packs (not counting the free Bretonnia update or the at-launch Chaos Warriors), so if you’re hoping for at least one more race, that’s understandable. And there’s no shortage of material – there are plenty more armies in the lore that could be added to the videogame (e.g. Araby, Southern Realms, maybe Albion). And with Total War: Warhammer III still in pre-production (as of this February update), I’d be very surprised if the next full game is announced any time soon, let alone released. One more race pack would seem an ideally-sized morsel to satiate the ravenous community in the interim. But still, no promises have been made, and the Warhammer front will certainly be quiet for a while now as CA builds to Total War: Three Kingdoms in May.